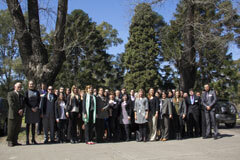 The workshop for Central and South America on the prosecution of illegal traffic of hazardous wastes under the Basel Convention was held in Buenos Aires, Argentina, from 28 to 29 August 2013. The workshop provided training for prosecutors, law enforcement experts and lawyers, based on the Basel Convention's instruction manual on the prosecution of illegal traffic in hazardous wastes. Prosecutors and legal officers from 13 countries attended the event, including officers from Argentina, Bolivia, Brazil, Chile, Colombia, Costa Rica, Ecuador, Guatemala, Panama, Paraguay, Peru, Uruguay and Venezuela. They were joined by Experts from the European Network for the Implementation and Enforcement of environmental Law (IMPEL) Cluster Transfrontier shipment of waste (TFS) Environmental Prosecutors Network, Latin American Environmental Prosecutors Network (LAEPN), UNEP Regional Office for Latin American Countries (ROLAC), Interpol and the CITES Secretariat. The workshop was organized by the Secretariat of the Basel, Rotterdam and Stockholm Conventions and the Basel Convention Regional Center – Argentina. Among the challenges identified were weaknesses in the national legal and institutional frameworks, such as incomplete implementing legislation – lack of a clear definition of the crime, of adequate penalties and of clear procedures. Participants felt that the various legal responses to illegal traffic – administrative, civil, criminal, alternative dispute resolution, each have their own merit, however opinions diverged with respect to their respective effectiveness. The need for clarity as to when a specific procedure may be initiated and on the relationship between the various procedures (parallel, successive, alternative) was also highlighted. Participants underscored that cases of illegal traffic are complex and require substantial capacity: an improper investigation can mean that a case cannot ultimately be brought forward. Therefore, besides training, participants called for access to adequate resources, for instance laboratories to identify wastes, and access to technical knowledge. Finally, cooperation at the national level was identified as a challenge and the establishment of interagency teams involving all relevant agencies was suggested. Based on real cases, participants also explored the practical and legal challenges in preparing a case for prosecution in particular with respect to the distinction between waste and non-waste, and the need for developing a common understanding of this distinction. Issues of jurisdiction (which State prosecutes and for which offense?) were also discussed, as well as the challenges associated with the take back of illegal shipments. A first workshop had been held in Bratislava in June 2012 for prosecutors from Central and Eastern Europe, Caucasus and Central Asia countries. The series of workshops are funded through the European Union under the Thematic Programme for Environment and Sustainable Management of Natural Resources including Energy (ENRTP).